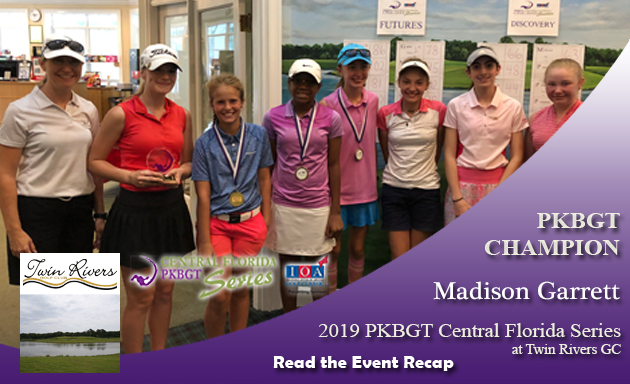 On Saturday, April 6, the 2019 Peggy Kirk Bell Girls’ Golf Tour played the Central Florida Series at Twin Rivers GC in Oviedo, FL. The PKBGT is excited to be working in partnership with Insurance Office of America as the presenting sponsor of the series for the second year in a row! Taking home the championship in the Futures Division, was Madison Garrett (Tampa, FL 2019) after shooting a score of 78 (+6). Garrett took home the trophy for the second week in a row with her performance! Finishing in second place with a final score of 81 (+9) was Tiffany Colin (Wesley Chapel, FL 2023). Like Garett, Colin finished in second place for the second week in a row! In third place was Abigail Fernandez (Windermere, FL 2023) with a final score of 81 (+11). Hannah Booth (Oviedo, FL 2025) finished in fourth place with a final score of 86 (+14). Rounding out the top five was Kaylee Dwyer (Mokena, IL 2024) with a score of 90 (+18). Mixon birdied back-to-back holes on her back nine as the highlight of her round. The Champion of the Discovery Division for the second week in a row was Bretton Mackiewicz (Longwood, FL 2025). Mackiewicz posted a phenomenal score of two-under-par 34 to take home the title! Riley Fletcher (Winter Springs, FL 2025) finished in second place with a score of 44 (+8). Brynn Pressimone (Longwood, FL 2026) finished in third place with a score of 43 (+7) on the afternoon. In fourth place with a score of 48 (+12) was Madison Dusenbury (Deland, FL 2028). Rounding out the Top Five was Adriana Pagan (Oviedo, FL 2026) with a score of 51 (+15). The PKBGT is back in action April 27 for the Central Florida Series at The Bayou Club in Largo, FL. Make sure to #inviteHER to try out their first tournament FREE at a PKBGT Central Florida Series event!